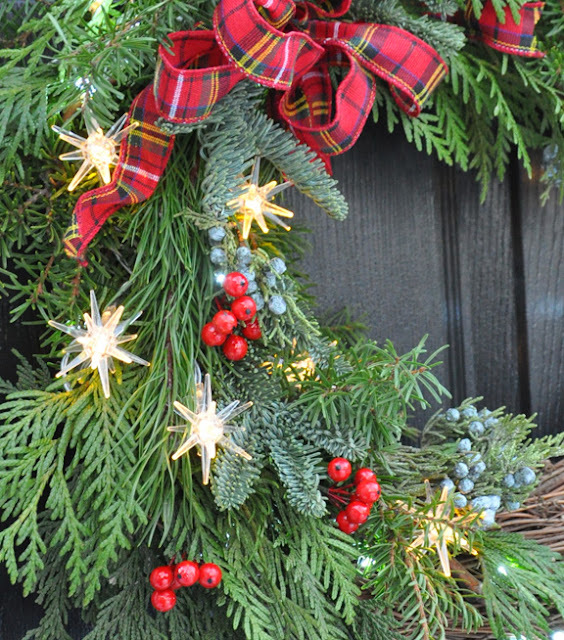 Come mid-November, it’s always nice to switch things up on the front porch of our Victorian-era house and add a little flourish of seasonal greenery to make things look festive for the holidays. 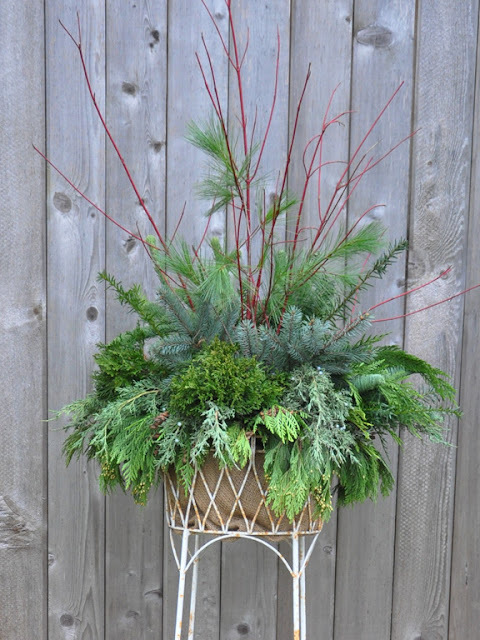 A wooden railing that runs along the length of the porch would tend to hide a typical arrangement of seasonal evergreens in an urn, so I have learned to get creative and use a metal plant stand that has some height. I purchased this plant stand years ago through Pier One, but a number of retailers sell similar items for outdoor floral displays. 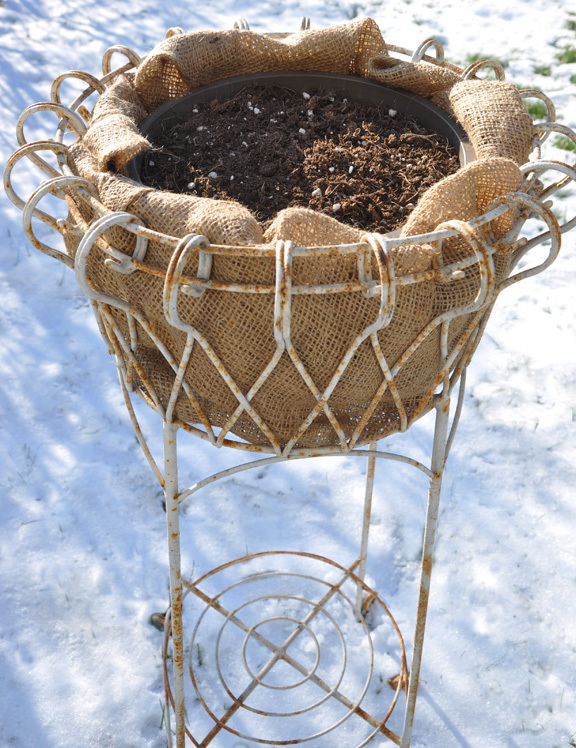 An exposed plastic pot could look tacky, so I began this project by tucking a square of burlap into the metal basket (if you don't have burlap, an old coconut liner will do). Next, I filled a plastic pot with potting soil. 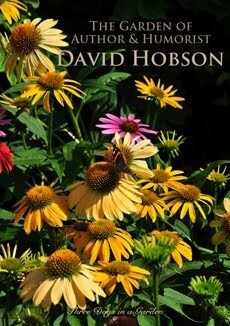 The soil need not be fresh and can easily be left over from your summer containers. 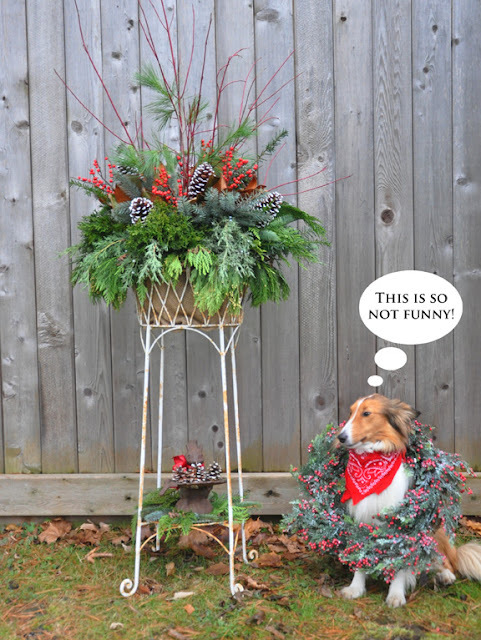 Its only purpose is to secure your evergreens in place. 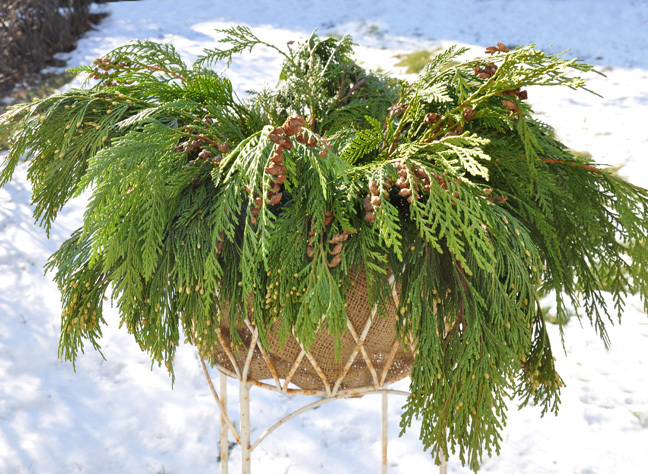 Moisten the soil, so when the ground freezes, it will provide an extra means of securing the stems of your evergreens. 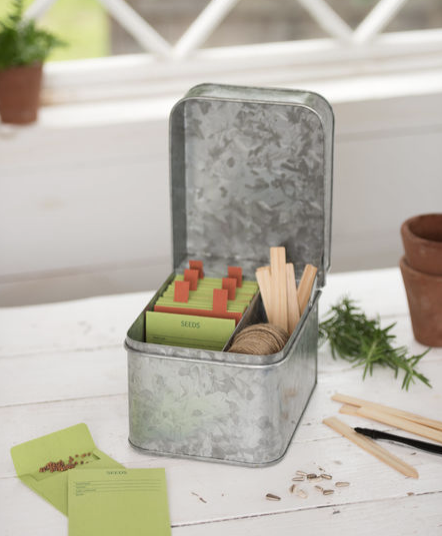 Place the plastic pot into the stand and tuck in the raw edges of the burlap around the top to keep things looking neat and tidy. 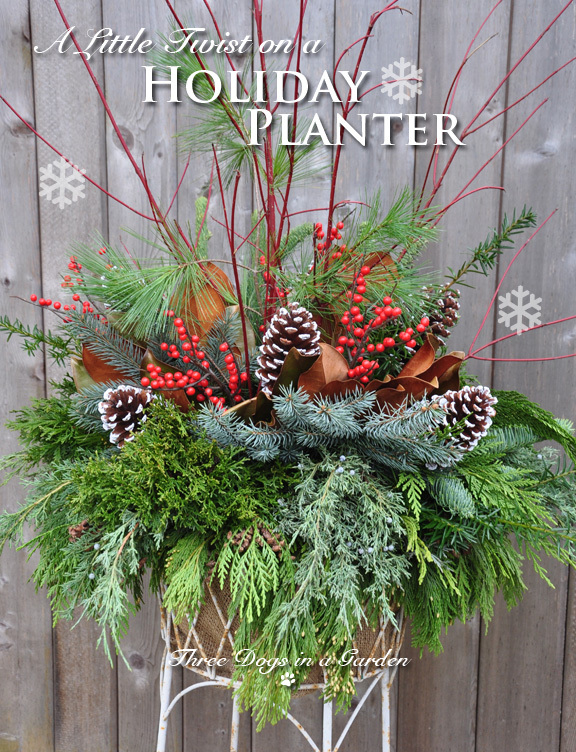 I always have quite a few holiday containers to fill, so I try to forage as much greenery as possible from the yard and the adjacent woodlot. I harvest responsibly so that I don't damage the trees or shrubs I am cutting. In the shady part of the garden, I am lucky to have quite a number of yews. 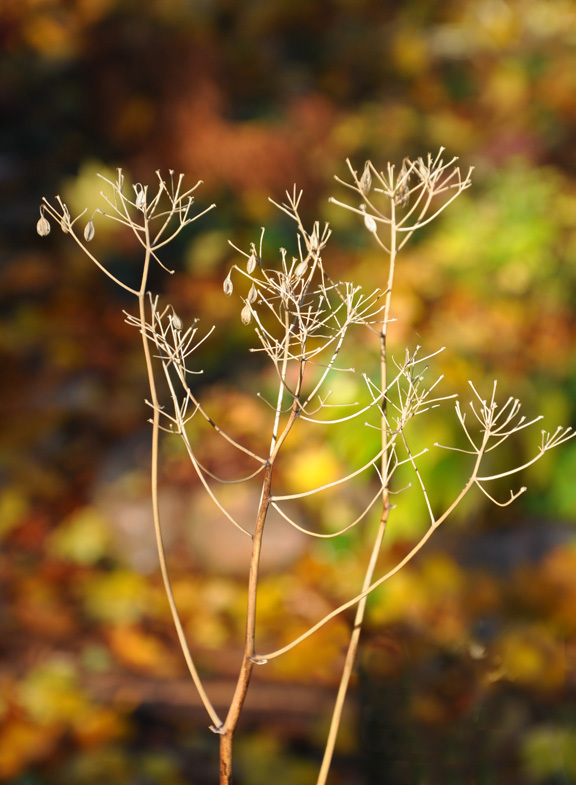 Every fall they get a good haircut which leaves me with quite a bit of raw material for my winter arrangements. 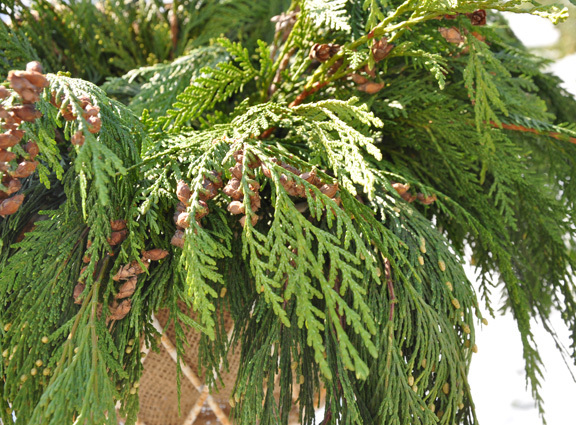 But even with the yew, I don't have quite enough evergreen boughs to fill all my containers, so I also buy mixed bunches of greenery from the grocery store. 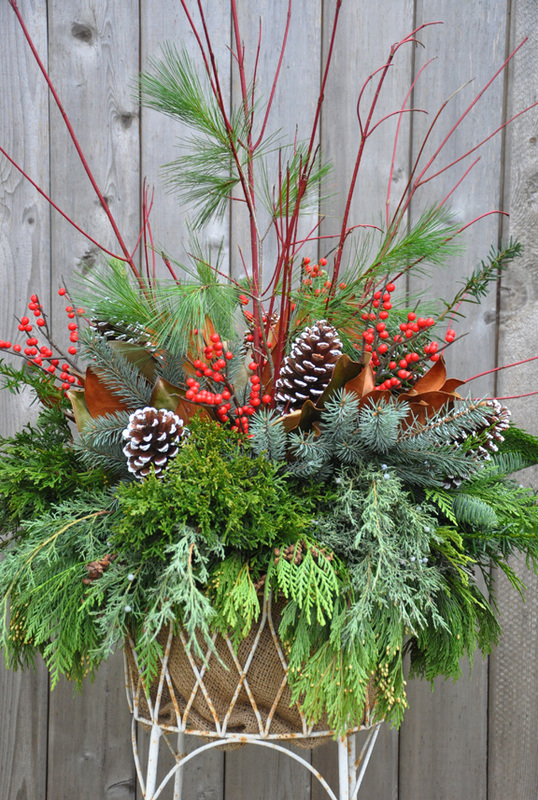 As with any nicely designed container planting, I recommend using "spillers, fillers and thrillers" to create a pleasing arrangement of greenery and berries. Begin with the "spillers" that will drape down over the edges of your basket. 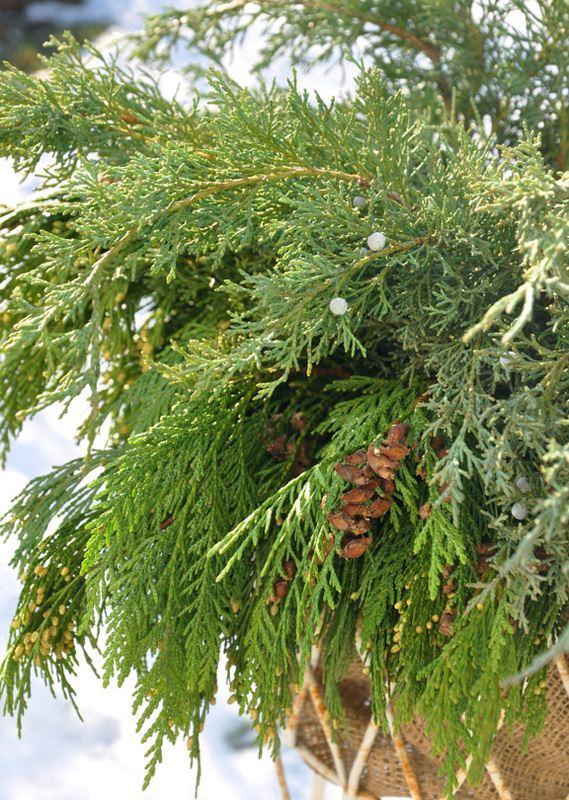 For this, I suggest long pieces of cedar, pine or juniper. 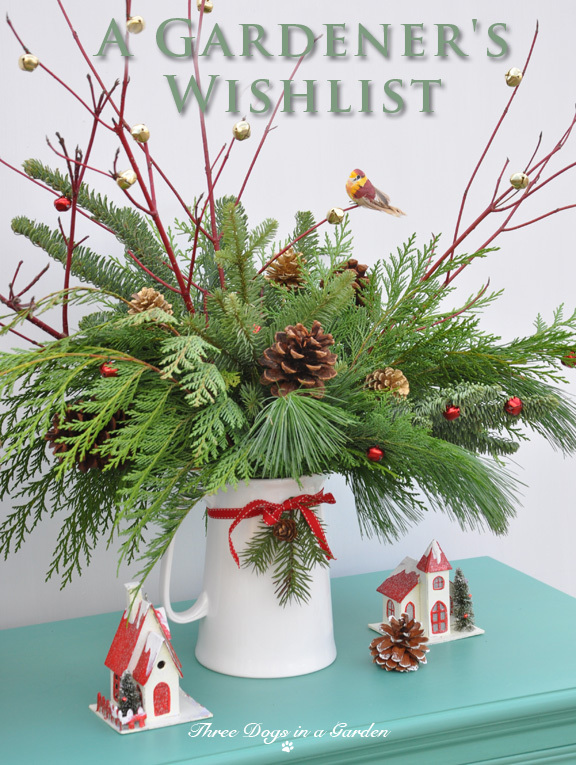 These evergreens have curved stems that allow them to hang down gracefully over the rim of the arrangement. Next, it's on to the "fillers" that will give the arrangement the fullness you want. 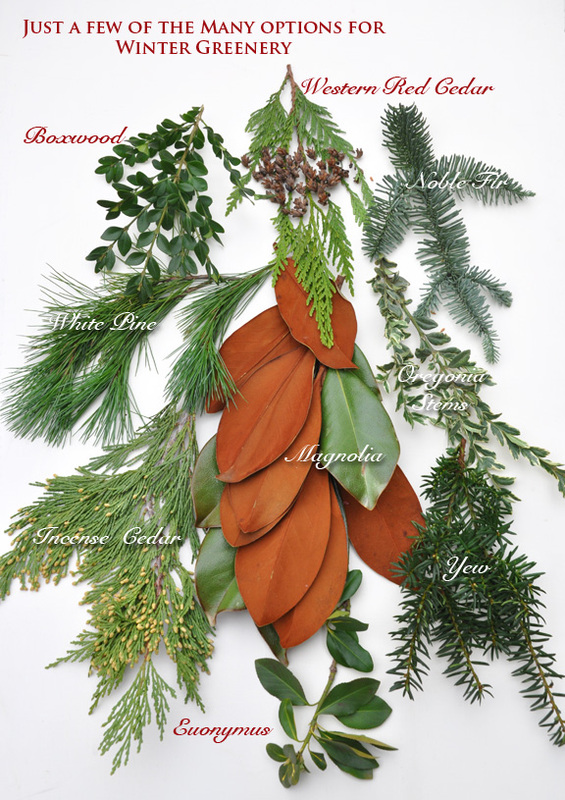 For this, you can use almost any type of evergreen. 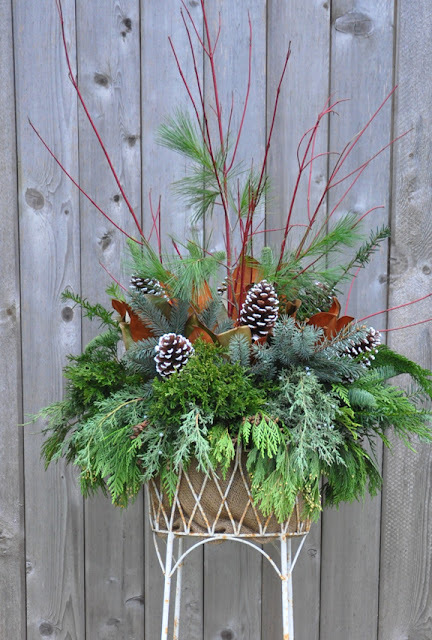 I used pieces of yew, cedar and fir. To add a bit of height, I used a few pine boughs and some Dogwood branches that I snipped from the garden. The last step is to add some colorful accents. 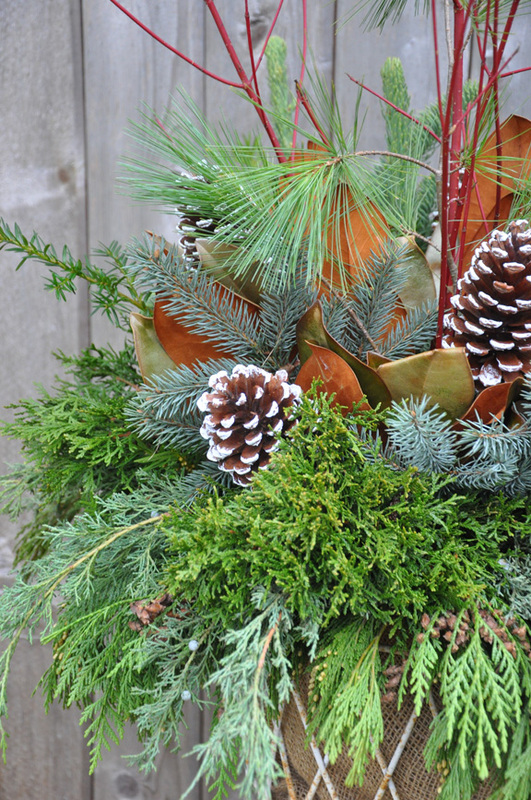 I began with some Magnolia branches and some pine cones. For a final pop of color, I used some red berries. If you are lucky enough to find them, fresh Winterberries are a terrific option. In this case, I used some faux Winterberries I had on hand. 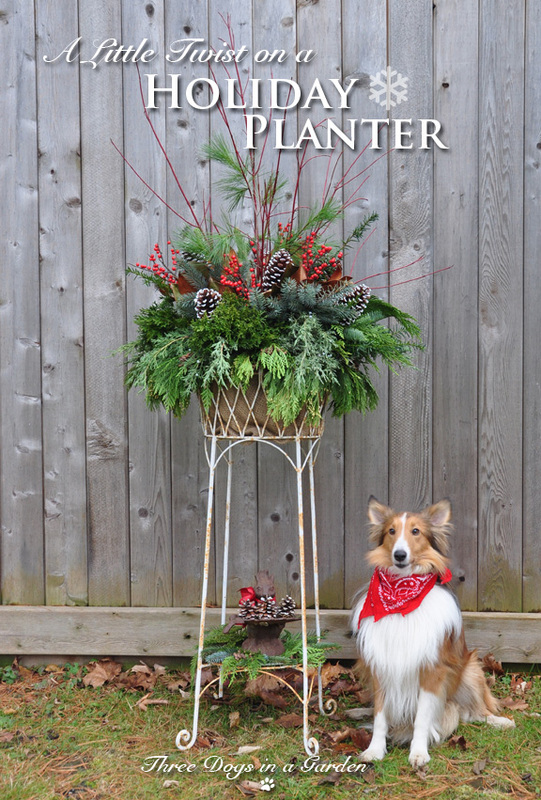 Here's the finished holiday plant stand with my faithful helper alongside. One last consideration with this type of holiday arrangement–it's top heavy. A strong winter wind could topple the whole thing over. 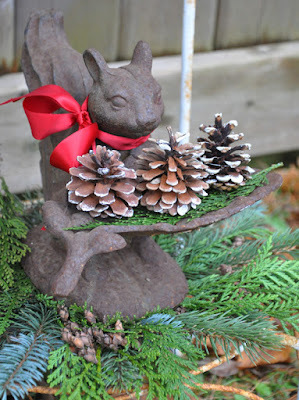 To balance things, I placed a heavy cast iron figure of a squirrel on the base of the stand. If you don't have an object like this, a second smaller arrangement at the bottom of the stand might be nice. Of all the houseplants on my windowsill, I water my two Fittonia the most often. This is not surprising given that Fittonia spp. is native to the rainforests of South America where they flourish in the hot, humid environment of the jungle's understory. 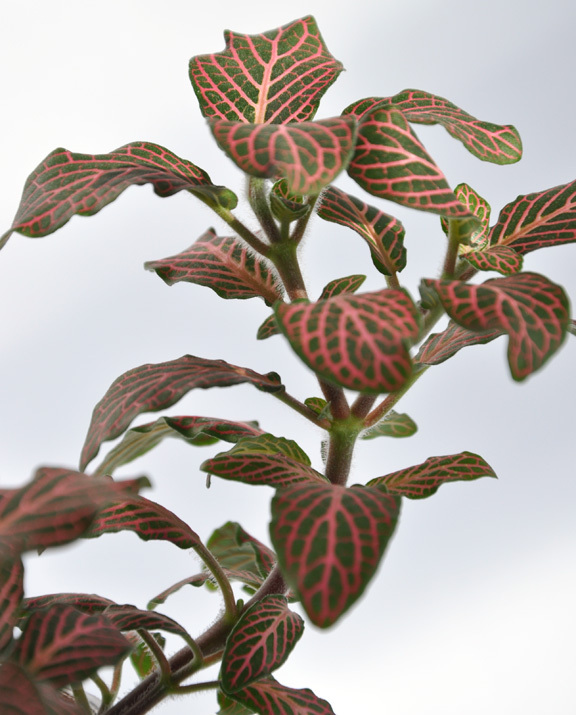 The foliage, which is veined in pinkish-red, white or green, give the plant its common names Nerve plant or Mosaic plant. Fittonia does bloom, but the flowers are very unremarkable. 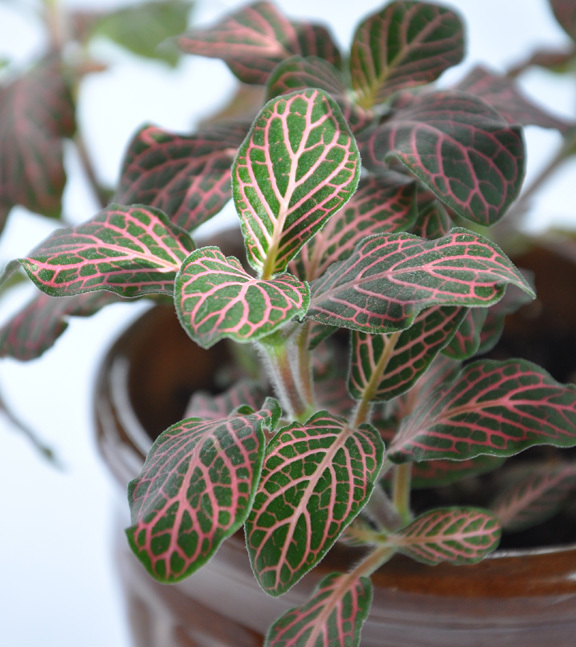 The reason you want to grow this houseplant is its unique foliage. Fittonia grows happily in the filtered light of the rainforest. 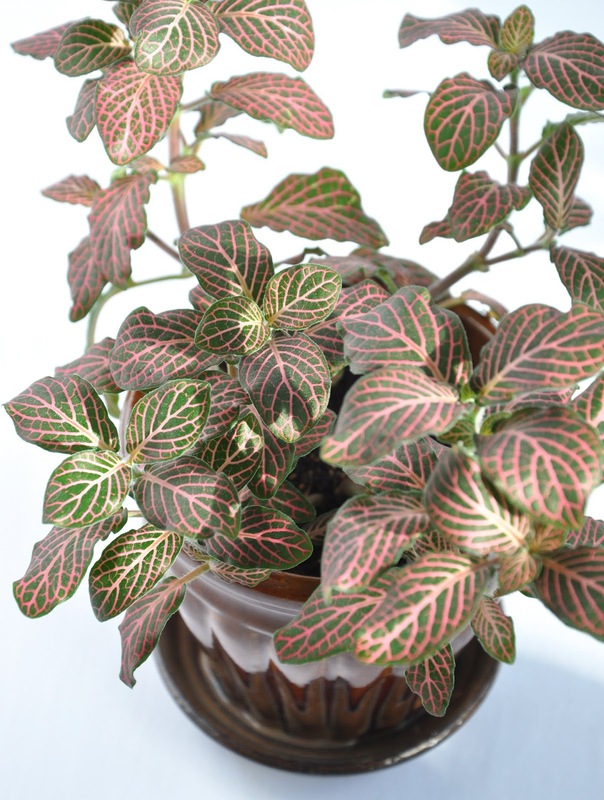 An east or north facing window that provides bright, indirect light is therefore perfect for this plant. 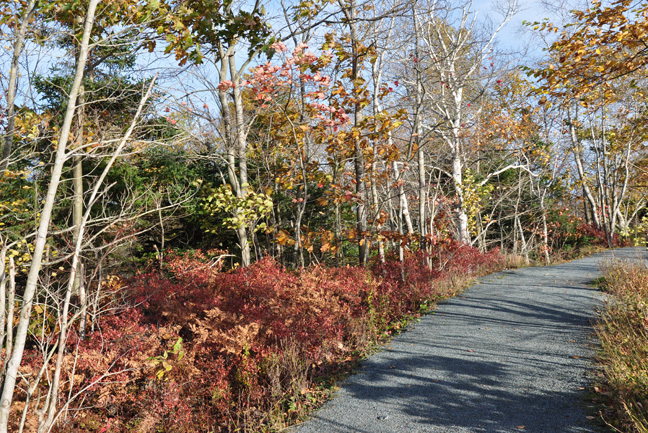 Too much sun can actually scorch the foliage. Even though my windowsill faces east, the summer sun can be a bit too intense for my Fittonia. When that happens, I shift their location away from the window ledge or into the shade of other large houseplants. Keeping the soil consistently moist, is the biggest challenge this plant presents. I find I have to water my plants every three to four days. A little too dry and they droop. Really dry and a Fittonia will collapse altogether. Though they always look a little like they are on death's door at that point, I find they always recover when I water them. 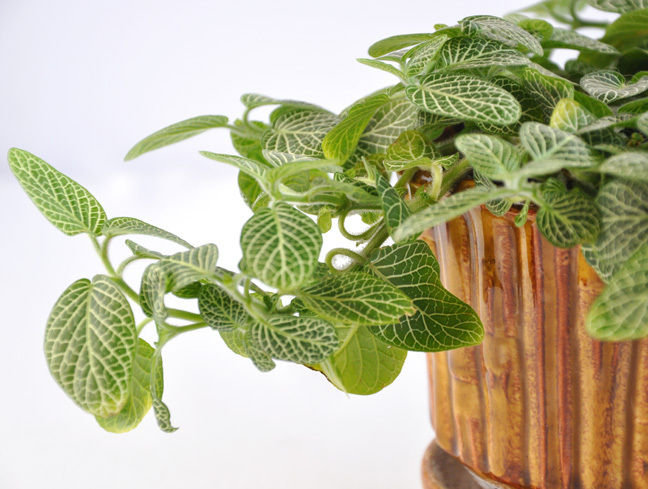 Although Fittonia will recover from the occasional fainting spell, allowing them to wilt repeatedly will eventually take a toll on the plant's overall health. 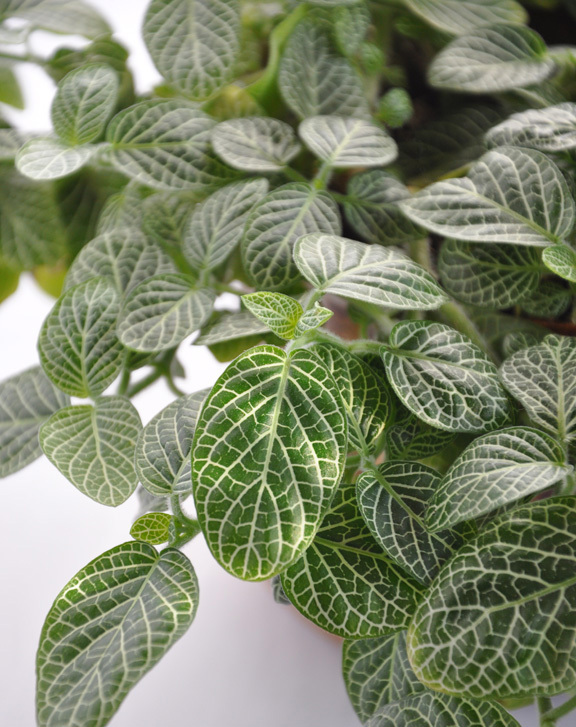 As well as a regular supply of water, Fittonia like humidity. That is why you'll often see dwarf varieties used in the moist environment of a closed terrarium. 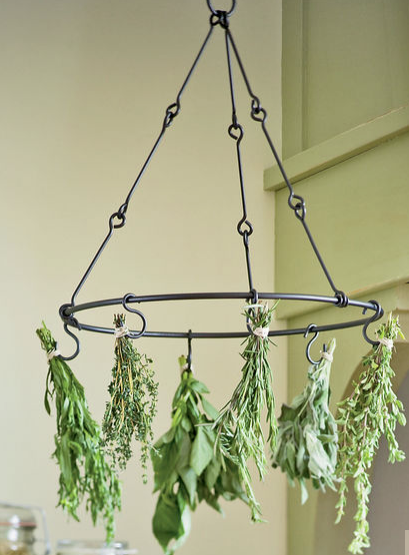 In my own experience, I find that keeping the soil consistently moist seems to suffice, but if the air in your home is really dry, you can mist the foliage of your Fittonia with tepid water. A peat-based potting mix (like the ones typically used for African Violets) will help keep the soil of your Fittonia moist, but not soggy. During the spring and summer feed your plant every other week with a liquid fertilizer formulated for tropical plants (following the package directions). The leaves have a smooth finish, but the stems are covered in fine hairs. Fittonia can become leggy over time. Pinching back their growth will encourage a bushier plant. 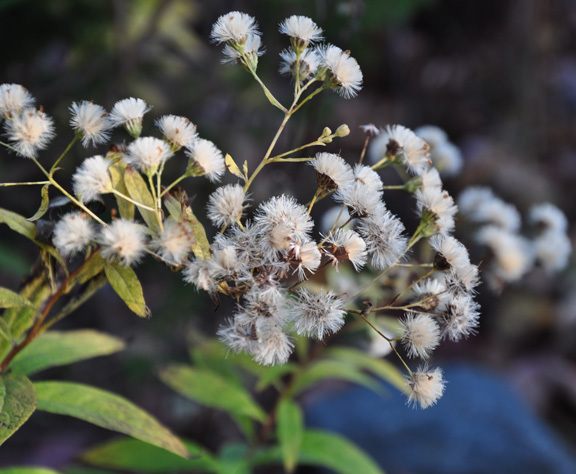 Flowers waste the plant's resources, so it's also a good idea to pinch off any flower spikes that will weaken the all-important show of leaves. Spring is a great time to propagate cuttings. To make new plants, take a 2-inch stem cutting and root it in some moist potting mix. You'll know that roots have sprouted when you see signs of growth (typically in 2-3 weeks). 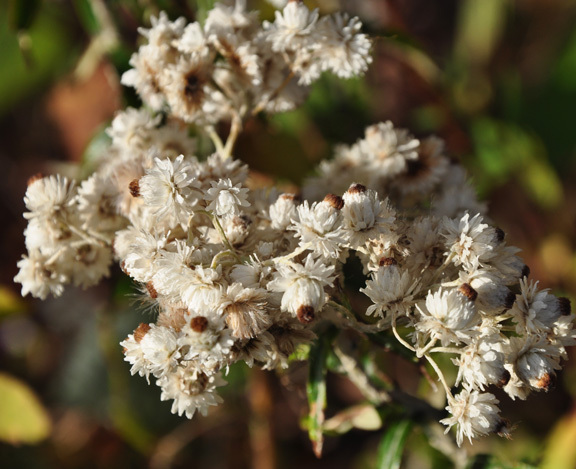 The foliage will warn you if the plant is unhappy with any of its growing conditions. 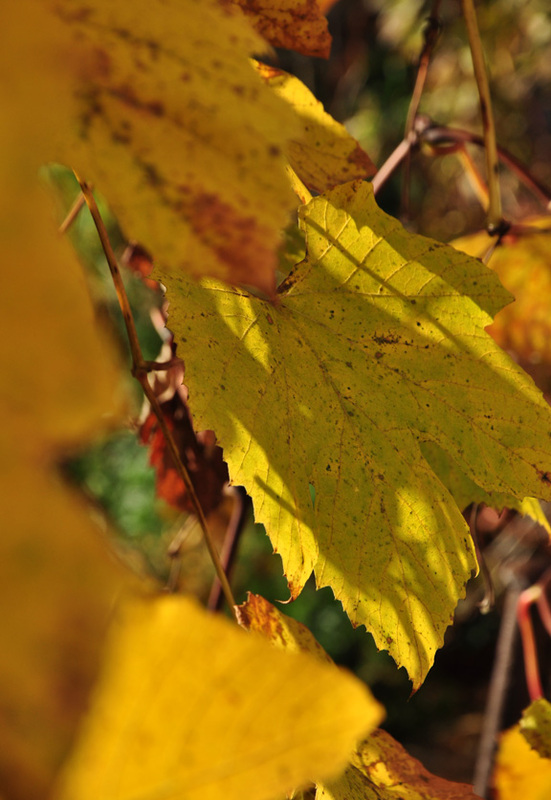 Leaf drop is a sign that the temperature is too cold for its liking. 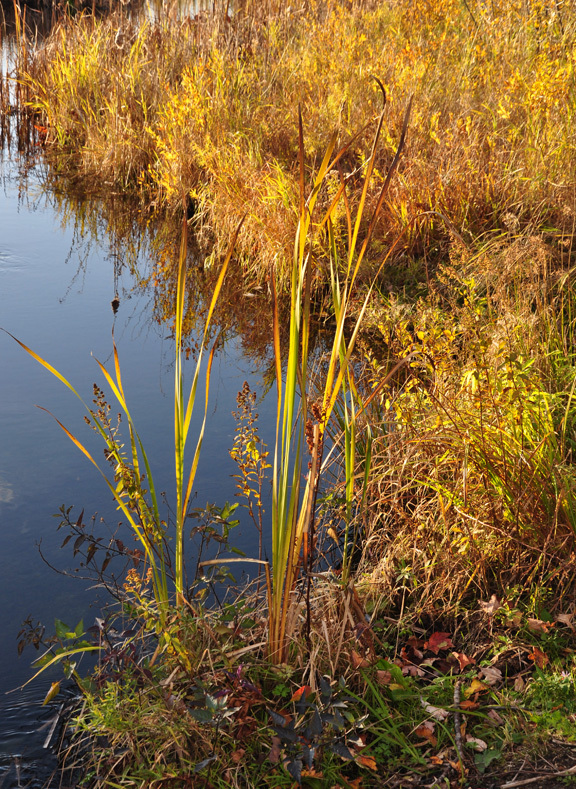 Yellow leaves usually indicate overwatering. Dry, brown leaves are a sign there is not enough light and humidity. 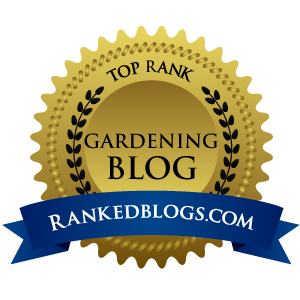 Mealybugs, fungus gnats and aphids can all be potential problems. If you discover an issue with any of these pests, isolate the affected plant/s and treat the problem. 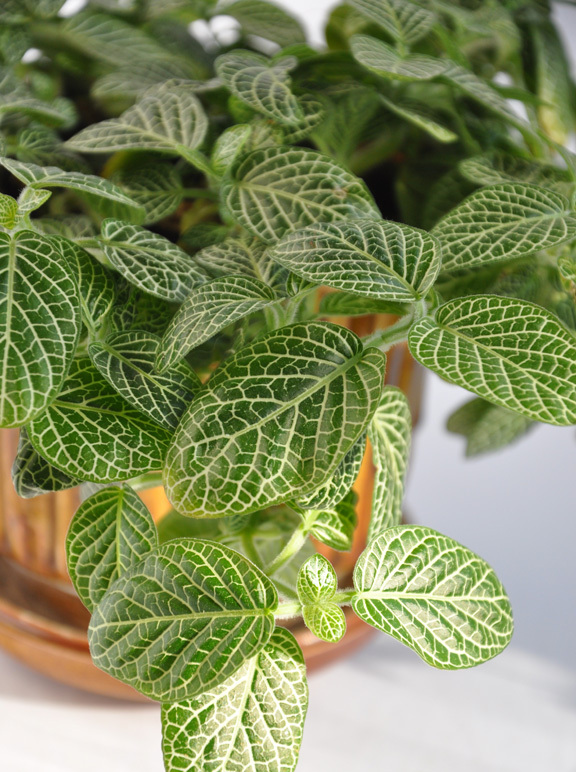 If you get the watering right, I think you'll find that Fittonia is pretty easy to grow. 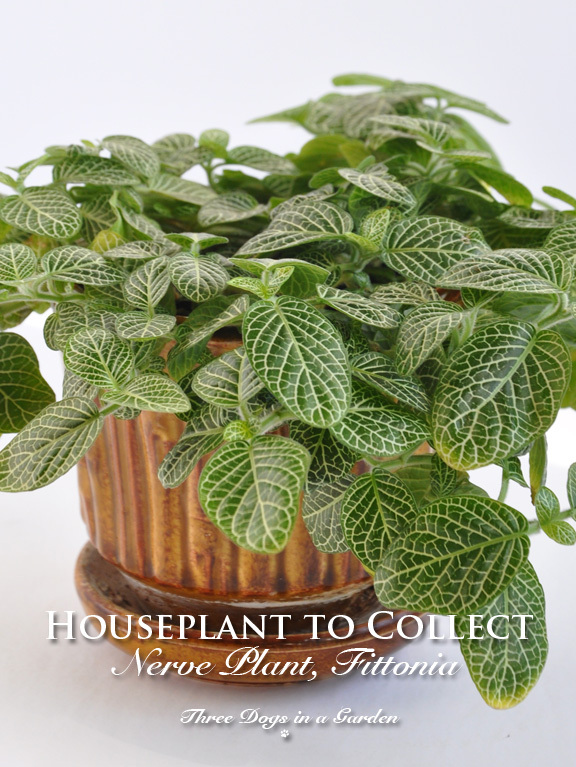 This plant is sure to make an attractive addition to your houseplant collection. Bookmark this post with a PIN. I am trying to do less shopping these days. At a certain age, you stop needing more "stuff". Once you've hit a number of significant milestones (I will reach a big one in just a couple of weeks), you come to realize that "stuff" always needs to be dusted, organized and stored away. So...if you are shopping for yourself or the gardener in your life this holiday season, why not purchase an experience rather than an object that will need dusting? Here are some local examples, but I am sure there are similar events in or near your hometown. 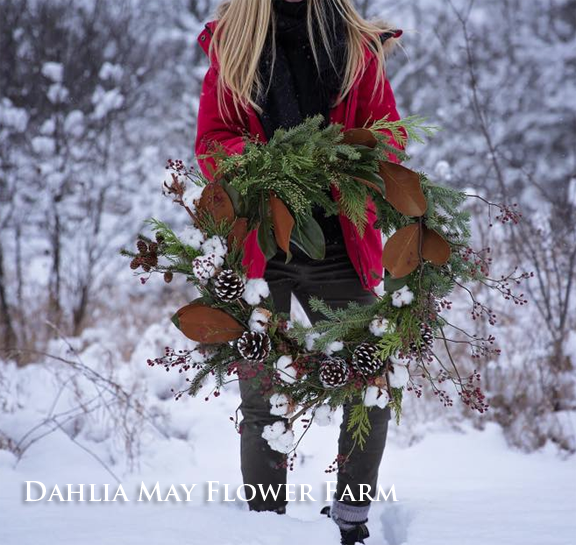 How about purchasing a ticket for a Christmas Wreath Workshop? 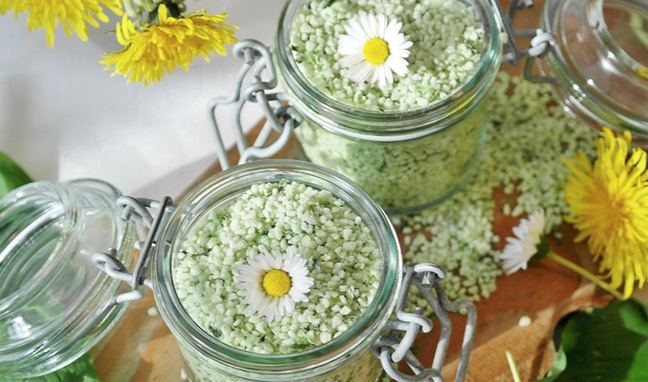 Or how about a class on making your own facial scrubs, masks and cleansers ($40 through the Toronto Botanical Gardens). Class participants will take home recipes and some samples. 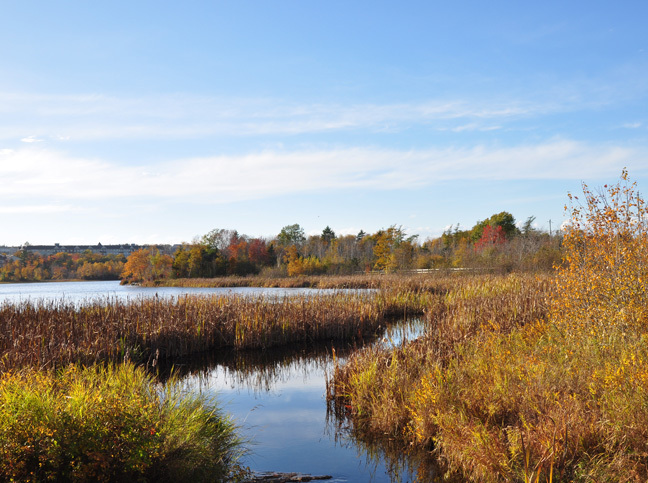 Next are 2 different workshops held in nearby Cambridge, Ontario. 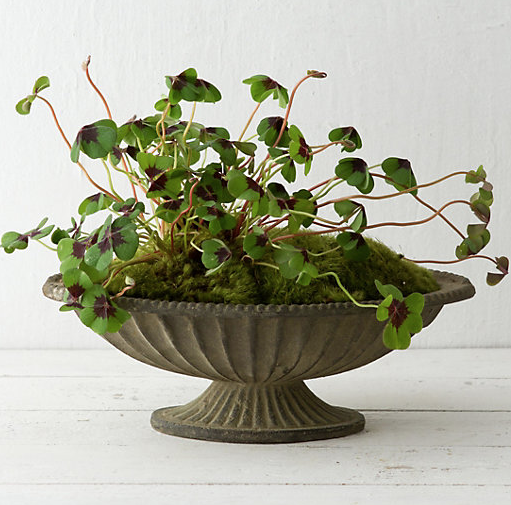 In the first workshop, you'll fill a mercury glass compote with flowers and greenery. 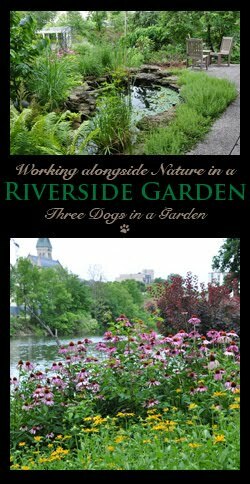 $125/pp or $195 for two participants includes materials, instruction and a light lunch. In the next workshop, you'll fill two tabletop urns. $195/pp or $295 for two participants includes materials, instructions and lunch. For tickets and details visit The Potting Shed. And now, are you ready for the ultimate experience not-soon-to-be-forgotten? If your budget is generous (and I mean generous), how about a once-in-a-lifetime trip for yourself or the gardener you love best? 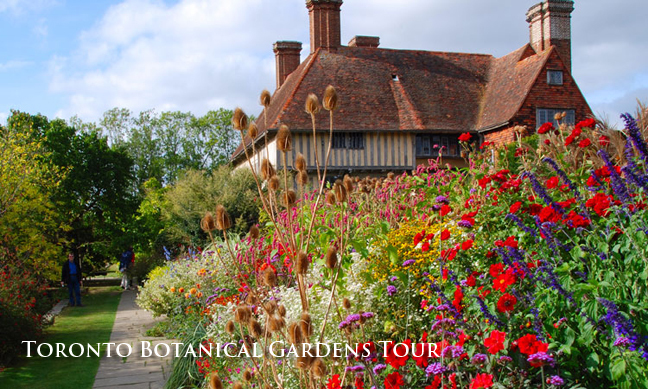 The Toronto Botanical Gardens has organized a June tour of some amazing British gardens including Great Dixter, Sissinghurst and Hidcote Manor. There' s even plans in the works to visit Highgrove Gardens (the home of Prince Charles). What an inspiration it would be to see these world-famous gardens! To find similar workshops in your area, try Googling the words "workshop" and the name of your hometown. When it comes to purchasing "stuff", I tend to favour things that have a use rather than objects that are purely decorative. The exception might be at Christmas time. Receiving a pair of pruners is rather like getting a toaster for Christmas. It's just way too practical! If I need a trowel, a good set of garden gloves or a pruner, I'll buy them for myself. I'd prefer to find something pretty under the tree. 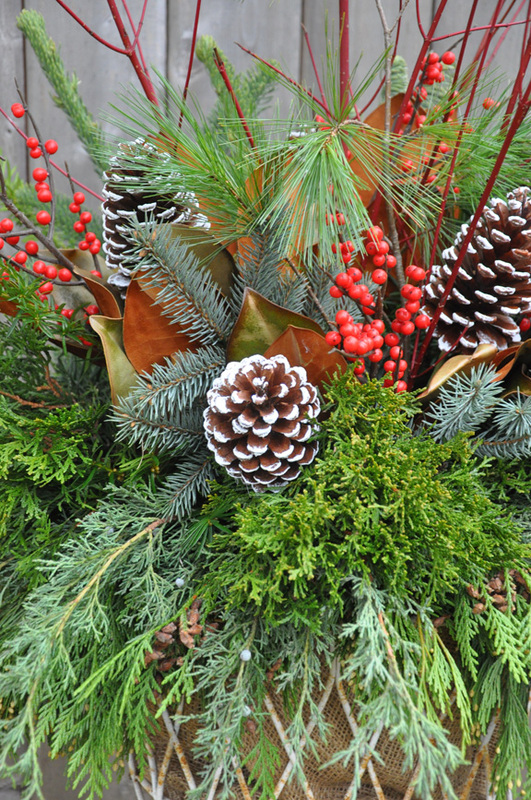 Seasonal decorations (above and below) inspired by nature are bound to be a hit with any gardener. 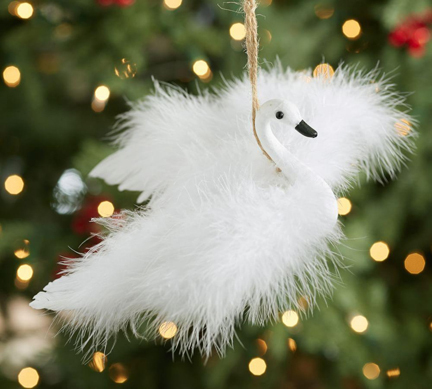 The decorative birds might also inspire the beginnings of a collection. Barn Owl, Pheasant and Spring Chicken. Long galvanized bucket $29.99 from Vintage North. 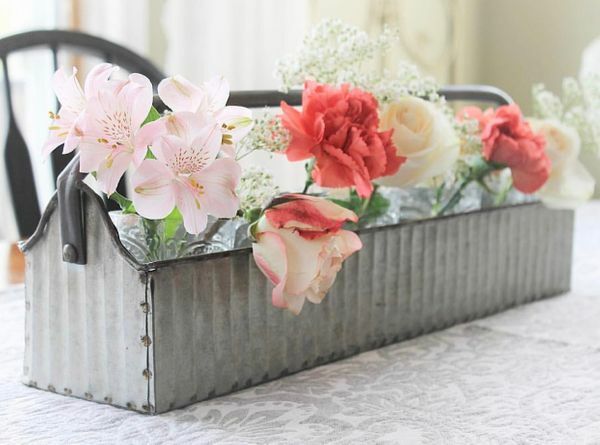 Wouldn't this long galvanized bucket be nice filled potted plants or flowers from your garden? 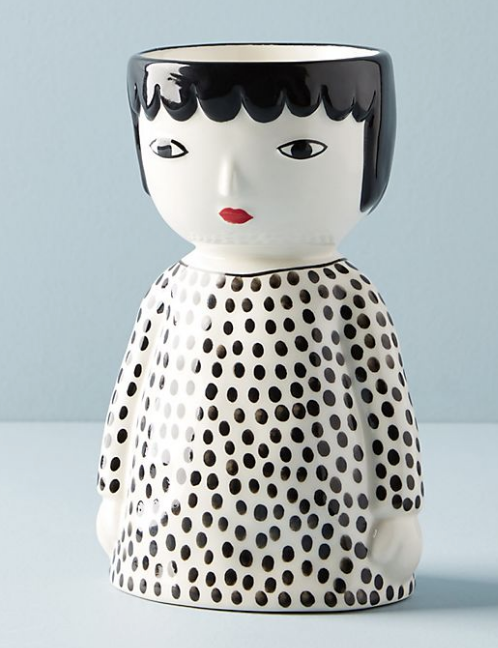 The next bunch of gift ideas manage to be both pretty and practical. 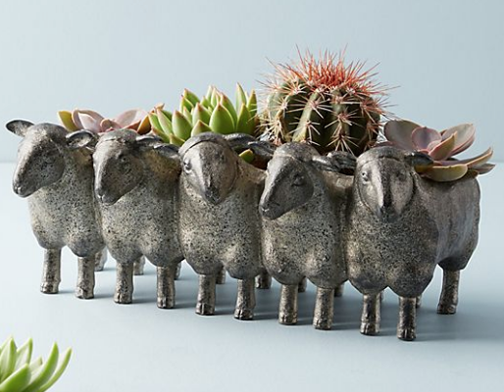 This urn would make any houseplant into the perfect table centrepiece. 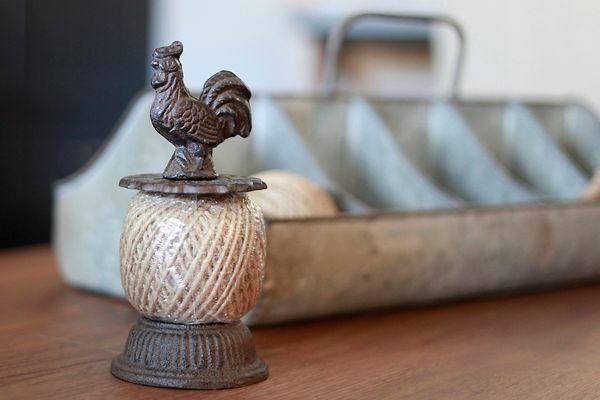 Aged Iron Pedestal Bowl from Terrain $54 (USA). I have lots of houseplants, but I rarely mix them together. The arrangement (above) is a great example of why that is short-sighted. 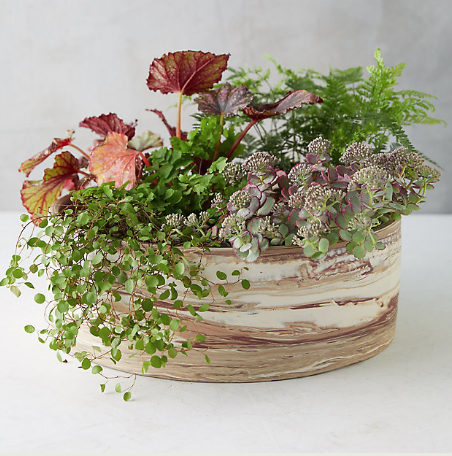 Marbled Earthenware Low Bowl Planter from Terrain $24-38 (USA). 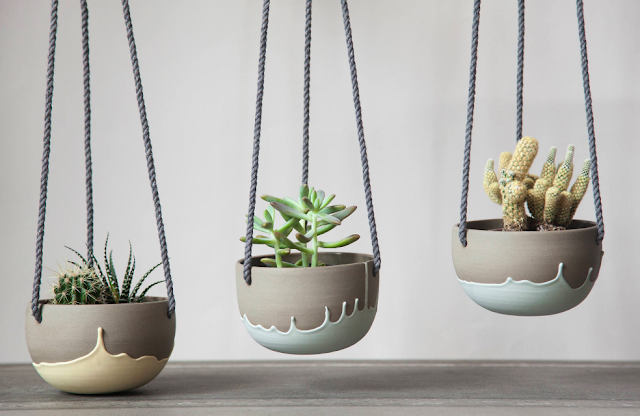 Hanging Earthenware Planter from Terrain $28 (USA). Succulents are not typically used in hanging pots, but don't they look terrific? 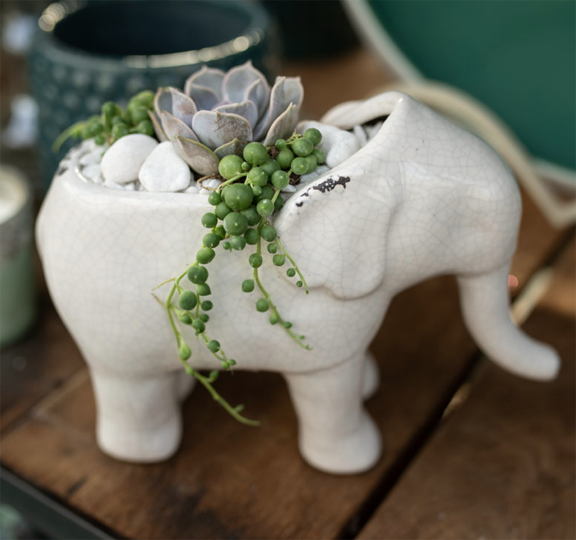 That succulents require to be watered less frequently would be a huge advantage. 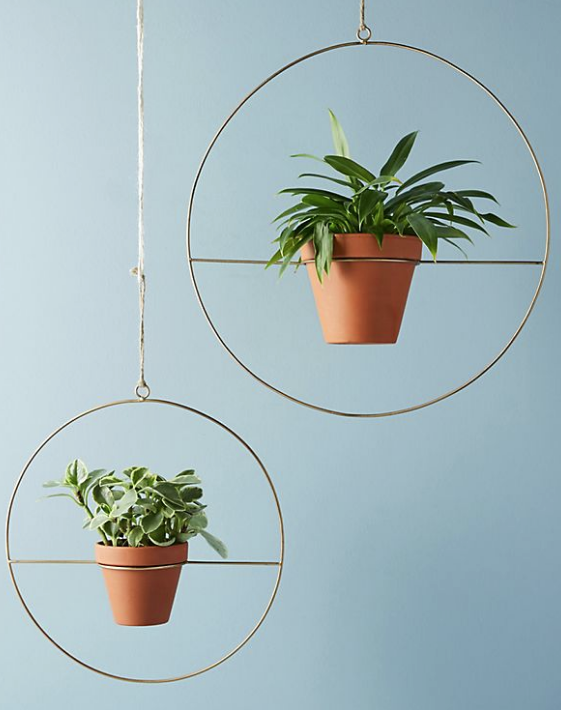 These hangers use geometry to great effect and would be perfect for the gardener with more modern sensibilities. 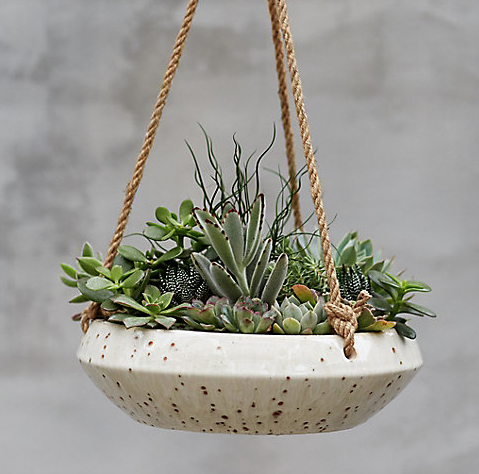 Hanging Geo Planter from Anthropologie $24-32 (USA). 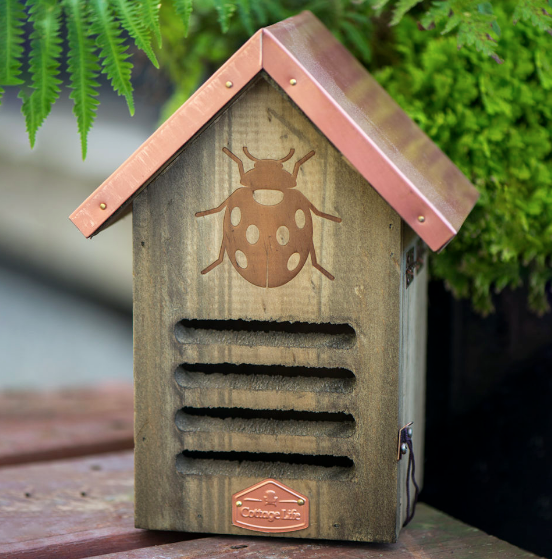 Most of these gifts are available online but don't let that deter you from visiting local nurseries and greenhouses. So many places offer seasonal displays, demonstrations and an array of terrific gifts ideas in the off-season. 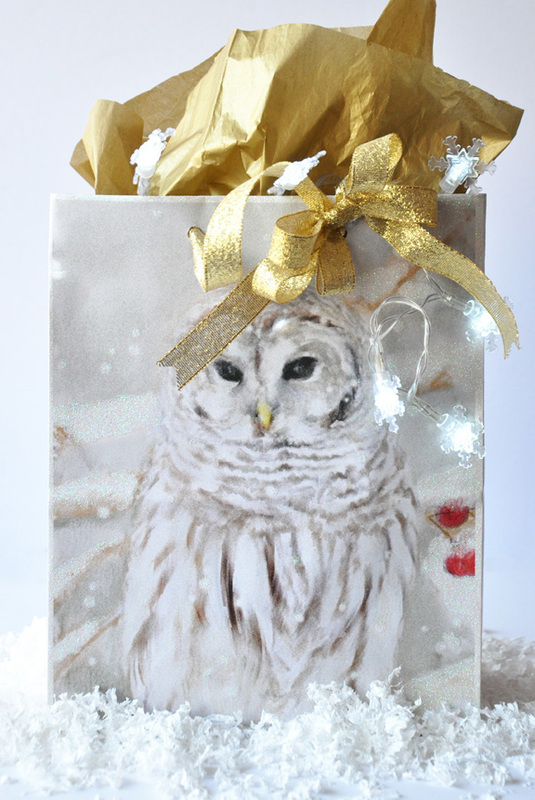 I hope this post has helped inspire your holiday shopping! 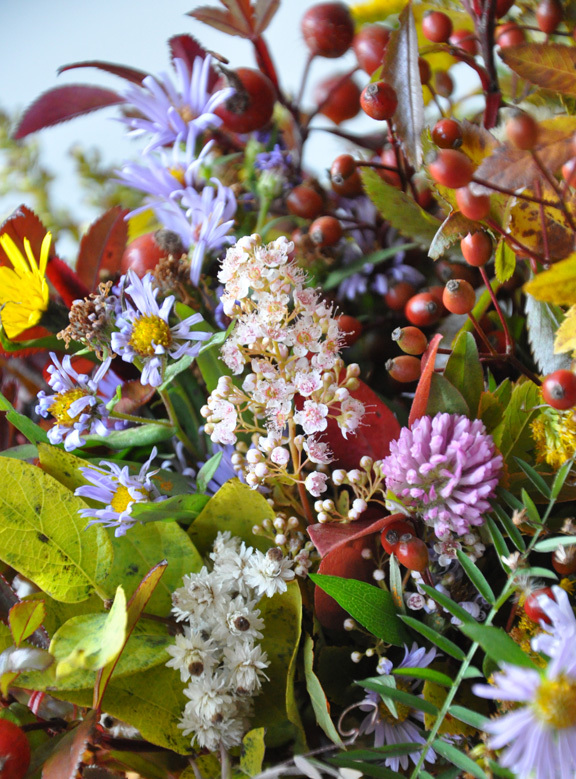 Wildflowers we gathered in my Mom's memory. I got the call from my Dad on a Sunday morning in late October asking me to fly home to help care for my Mom. We had almost lost Mom a month earlier to pneumonia, but the entire family gathered around her hospital bed, and by some miracle, Mom rallied. The initial relief we all experienced at her recovery was, however, overshadowed by the news that Mom had lung cancer. That Sunday afternoon, my husband ran some laundry and started to pack a bag for me while I booked a plane ticket online. I practically ran to the gate to catch my flight that evening. Ironically we sat on the tarmac in Toronto for over an hour while the crew addressed some mechanical problem on the aircraft. When I finally arrived well after ten, I was very glad to find my brother at the arrivals gate waiting for me. The lake across the street from my parent's apartment at the Berkeley. Pearly Everlastings growing on the shores of the lake. 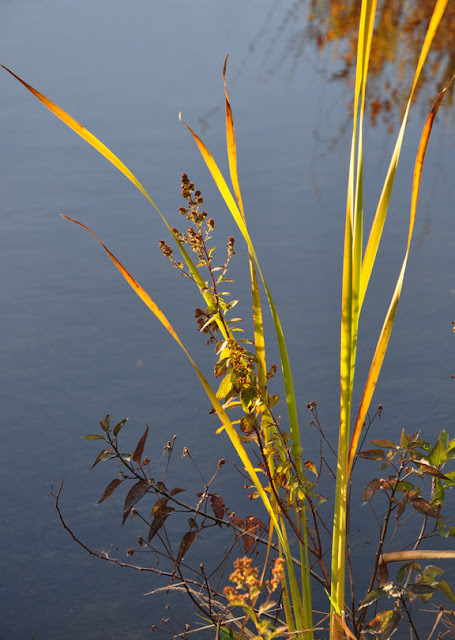 Reeds in the late-day sunshine. My parents were in their pyjamas when we reached their apartment at the Berkeley (a residence for seniors). Sitting up in bed, Dad seemed relieved to see me. Mom lay at his side propped up on some pillows. 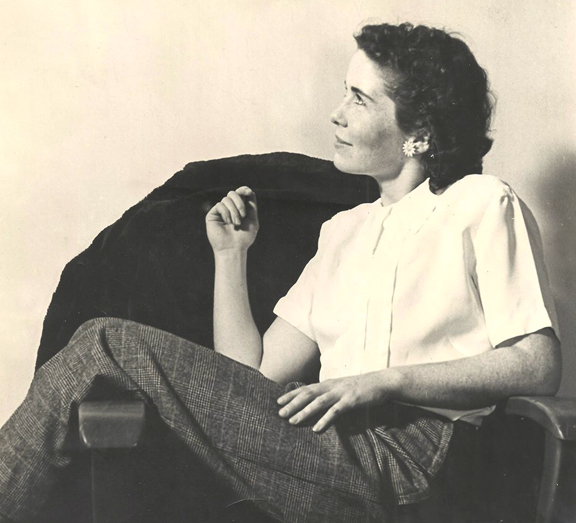 I had been home for her 94th birthday the weekend before, but her decline in the intervening week was dramatic– she was pale and thinner than ever. When she learned she had cancer, Mom elected to spend what time she had left at home with her husband of over sixty years. In the first weeks home, Mom did really well. Everything seemed almost normal. My sister, who lives in Ireland, even talked optimistically about booking a flight home to visit them in the spring. It was all to clear upon my arrival that Sunday evening that an ongoing struggle with emphysema and the new battle with cancer were taking a huge toll on my Mom. I called my sister the next day and suggested she should fly home as soon as possible. The difficult mornings began on Monday just before 5am. With badly swollen legs and feet, Mom didn’t think she could walk all the way to the bathroom. Sadly the commode, that my Dad had once used while recovering from a stroke, was in pieces at the back of a closet. 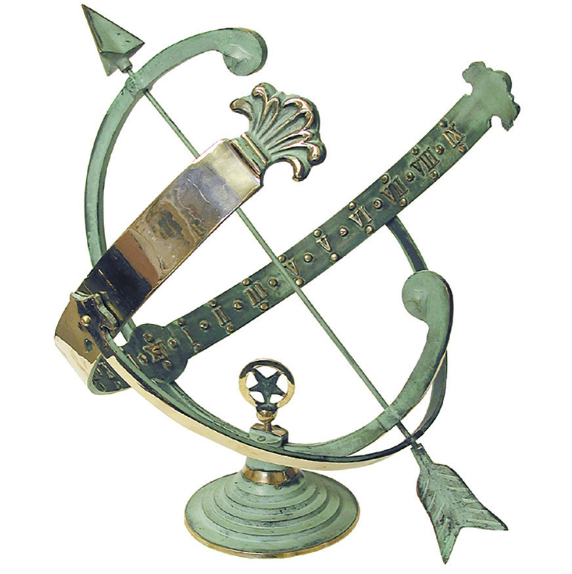 In the dim light of early dawn, my Dad and I began to struggle to piece the damn thing back together. I have not the slightest nack for puzzles and Dad wasn't fairing much better. "Read the instructions, Jen!" my Dad urged handing me a booklet outlining the steps for assembly. I took the manual in my hands, but the print was tiny with miniature illustrations that lacked any useful detail. In the meantime, I was acutely aware that my Mom waiting in the other room. To any onlooker, my Dad and I would have been a comedic pair if only the circumstances hadn't been so dire! "What’s taking so long? ", Mom called from their bedroom. We did finally piece it together, but boy oh boy, it was a rough introduction to my new role as a caregiver. When my mother learned she had lung cancer back in September she made a request to the doctor for medical assistance in death (MAID) that might alleviate any unwanted and unnecessary suffering at the end of her life. Mom believed that she had only to express her wishes and the doctor would put things into place and lead her through the process. The reality was very different. There is a great deal of bureaucracy surrounding a medically assisted death in Canada. 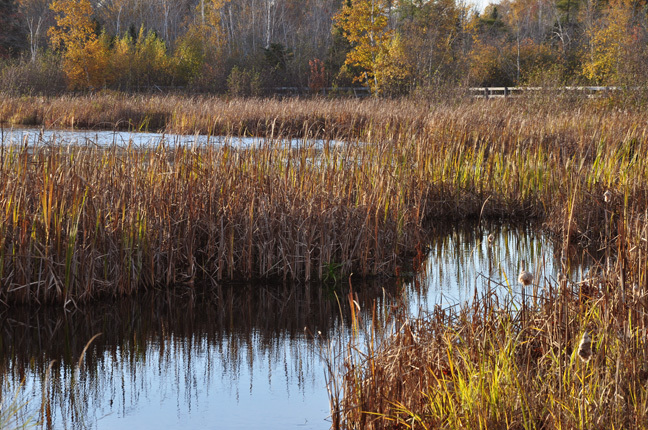 Laws and policies that vary according to the province or territory in which you live don't help either. In Mom's case, two doctors needed to do an assessment to determine if she was a candidate. Forms needed to be filled out and witnessed. After signing the written request, there is a 10 day reflection period (an exception can be made in special circumstances). Just before receiving medical assistance in dying, the patient must be capable of providing informed consent. Sadly this last rule greatly impacted another Halifax woman who had stage four breast cancer that had spread to her brain. Fearful that brain cancer might impact her ability to provide informed consent right before the procedure, she opted to end her life sooner than she would have otherwise chosen. It's so very sad! When life and death are involved, safeguards are understandable. But in my Mom's case, the bureaucracy surrounding medical assistance in dying couldn't respond fast enough to meet her rapid decline. At the time of her passing, we were still waiting on an assessment by a second doctor and palliative support was even further in the distance. No one feels a bitterness about this more than me. It was me who sat with Mom in the early morning hours when the pain spread across her chest and down her arms. Over and over she'd ask me why she was being made to suffer when she had expressed her wishes to the doctor so clearly back in September. I felt helpless to answer her. Our healthcare system had ultimately failed her. 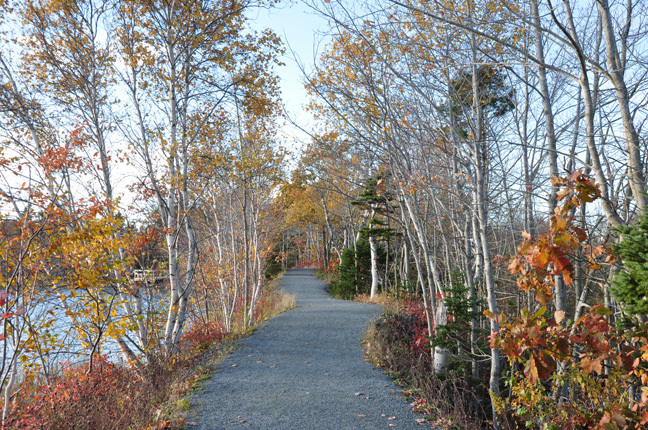 The gravel path that runs along the lakeshore. On Wednesday night, Mom's breathing was horribly laboured. At eleven I called Kelly (nurse) to help me get Mom settled in for the night. Then I retired to my place on the sofa beside her bed. Troubled and unable to sleep, I lay in the dark and listened to the Mom's ragged breath and the rhythmic refrain of the oxygen machine. Finally, I drifted off to sleep sometime around midnight. It was the silence that woke me just before two in the morning. I lay on the sofa for a moment feeling grateful that Mom was finally resting comfortably. But then that silence began to eat at me and I got up off the sofa to check on her. Mom had slumped down in the hospital bed. She looked so tiny she reminded me of a baby bird. I stood at the foot of her bed for a moment willing her chest to rise and fall. Nothing. I reached tentatively for Mom's wrist to check for a pulse. Nothing, but then I was so upset...maybe I was wrong. Grabbing my cell phone, I went out into the brightly lit hallway to call Kelly. "Can you come up and check on my Mom?" I asked my voice breaking a little. A minute or two later I heard the elevator and Kelly appeared. "I think my Mom may have passed," I managed to blurt just before I broke into tears. Thank goodness for Kelly! She was calm when I was anything but. She confirmed my worst fears and then left the room to call the paramedics. I picked up my phone again and called my two sisters, who piled themselves into a taxi in short order. All the commotion awoke my Dad who was sleeping in the adjacent bedroom. With his walker, he shuffled into the bathroom still mercifully oblivious of Mom's passing. I paced back and forth outside the bathroom until he emerged and I was able to share the sad news. The paramedics who arrived were kind and sympathetic, but because Mom had died at home and without palliative care in place, they informed me that her body would have to go to the medical examiner's office and a police investigation would need to be completed. As the primary caregiver, I found myself viewed as something I never in a million years would have guessed were possible– a suspect in my own mother's death. I don't want to get overly dramatic here. The investigating officers were nice and respectful. I reminded myself repeatedly that they were just doing their job. Thank goodness my sisters were there in time to see me through it all. So many feelings and emotions have colored the last few difficult weeks. I am angry that our health care system failed Mom in her final moments–those hours of suffering were cruel. That Mom had a long and happy life is a great comfort. I also feel an overwhelming sense of gratitude. What wonderful siblings I have! Many a time stressful situations like this can tear a family apart. Thanks also go out to the private nurses at the Berkeley. Ladies, I don't know what I would have done without you! Thank you for your kindness and your council. I am even grateful to Joanne of Because You Love Them Pet Services who came each day to play with the boys in my absence. Hearing the dogs' daily report cards was a bright moment at the end of what was always a long and difficult day. Painful as this post was to write, I feel I owe it to my Mom to speak out. When you're in pain and can't breathe properly, an hour can feel like an eternity. For Mom it was days. At this time, the procedures surrounding medical assistance in dying in Canada are too mysterious and too cumbersome. The process involved is a slow-moving mechanism that does not respond quickly enough to meet the needs of patients like my Mom. In short, the laws and procedures that surround medical assistance in death need to tempered with a bit more humanity.